The Faroe Islands are a tiny archipelago between the U.K. and Iceland. Fifty thousand people live on these rocky, barren islands, and we are lucky enough that five of them decided to form Hamferð, self-proclaimed purveyors of Faroese doom metal. Támsins likam (Body of the Mist) is Hamferð’s conclusion of a conceptual trilogy that began with an EP in 2010 and 2013’s full length album Evst. The trilogy takes place in reverse chronological order, so Támsins likam is really the beginning of the end. It explores mortality and loss from a distinctly Faroese perspective, according to vocalist Jón Aldará. We’ll have to take his word for it, because all of Támsins likam is sung in Faroese. This actually makes the album even more effective. While we can’t understand the lyrics, Aldará’s emotional delivery, from the palpable loss evident in his cleans to the coffin-like grating rasps of his harsh vocals, is second to none in the doom metal genre. Musically, this is one of the most exquisitely produced and performed albums you will hear this year. With access to a fully-equipped recording studio, the band made excellent use of the time and gear. Daniel Bergstrand, who worked on Pain of Salvation’s excellent album last year, mixed the record, and it sounds amazing, full of vitality and nuance. So we know the vocals are stellar and the production is top-notch: what about the actual songs? The six songs on Támsins likam are 44 minutes in total, ranging from five to twelve minutes in length. The pacing is typical of doom albums, with only the march of “Hon syndrast” upping the glacial tempo. That being said, every song envelops us, drawing us deeper into their spells the more times we listen. “Fylgisflog” opens the album, a slow, clean-picked arpeggio atop muted strings. Drums and piano make a momentary appearance, upping the tension as Aldará greets us with his low, plaintive clean vocals. The pacing is deliberate and evokes such an atmosphere of tragedy that we find the outside world fading, and Hamferð’s music enveloping us totally. The song rises and falls like the waves that crash upon the Faroe shores, perhaps similar to a heavier, more emotional Pallbearer. While all six songs are standouts, I’ll quickly mention two more. Album closer “Vápn í anda” is a twelve minute funereal epic featuring impeccable instrumentation – clean guitar, eerie strings, and grim piano – and the best of Aldará’s already outstanding vocal performances. When the song hits us at the four minute mark with the full band and an unearthly howl, we can tell we are in the midst of something special. And that’s just the first half of the song. The other track of note is the band’s shortest, “Frosthvarv,” a song which makes us feel as though we are walking along the frigid shoreline, lamenting the loss of someone near and dear. Quiet and sad for the first half, “Frosthvarv” explodes forth in the second half like a soul-hunting monster, with screaming guitar chords and from-the-grave vocals. The five minutes perfectly encapsulates the band. 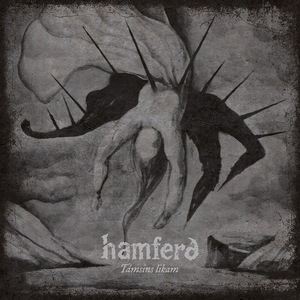 Hamferð have released a perfect doom album, and an early leader for end-of-year Best Of lists. With outstanding performances from every band member, fantastic songwriting and production that ties everything together seamlessly, Támsins likam is a tour de force for the band, and places them firmly at the forefront of the genre. Faroese doom metal is here to stay.